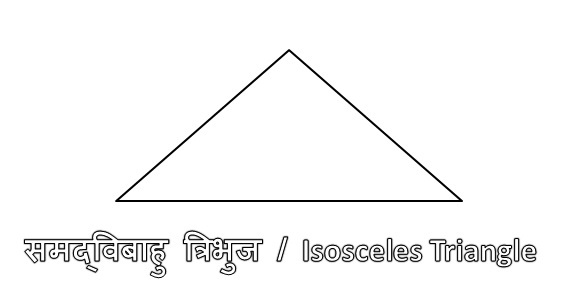 Definition of Triangle : The triangle is a polygon with three edges and three summits. This is one of the basic shapes in geometry. In other simple words we can say that the triangle is the sum of the three sides in which the sum of all three angles is 180 degrees. त्रिभुज की परिभाषा : त्रिभुज (Tribhuj) तीन भुजाओ से घिरी एक सरल आकृति है . जिसके तीनो कोणों का योगफल 180 डिग्री होता है . 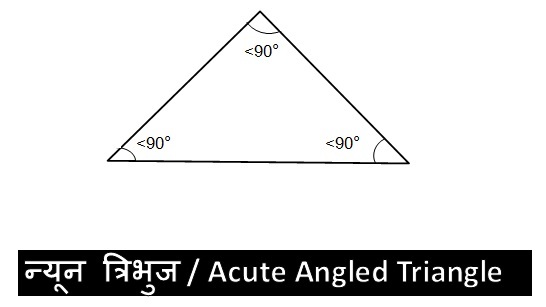 The Sum of three angles of a Triangle is 180 Degree. An exterior angle of one triangle is always greater than every other end. The sum of the two sides of a triangle is always greater than the third arm. For Example - In Triangle ABC , (i) AB+BC > AC (ii) AB + AC > BC (iii) BC + AC > AB. The difference of the two sides of a triangle is always smaller than the third arm. For Example - In Triangle ABC , (i) AB - BC < AC (ii) AB - AC < BC (iii) BC - AC < AB. त्रिभुज की तीन भुजाए होती है . त्रिभुज के तीन कोण होते है . त्रिभुज के तीन शीर्ष होते है . त्रिभुज के तीन विकर्ण होते है . त्रिभुज के तीनो कोणों का योगफल 180 डिग्री होता है . एक त्रिभुज का बाहरी कोण हमेशा दूसरे छोर से अधिक होता है. त्रिभुज के दो भुजाओ का अंतर हमेशा तीसरी भुजा से छोटा होता है. त्रिभुज की दो भुजाओ का योग हमेशा तीसरी भुजा से अधिक होता है. 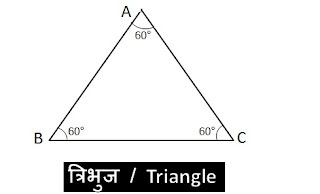 (1) Equilateral Triangle : A triangle having all the three sides of equal length is Called an equilateral triangle. समबाहु त्रिभुज : समबाहु त्रिभुज की तीनो भुजाए समान होती है . समबाहु त्रिभुज का प्रत्येक कोण 60 डीग्री का होता है . 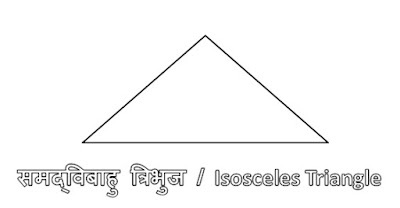 (2) Isosceles Triangle : A triangle having two sides of equal length is Called an Isosceles triangle. समद्विबाहु त्रिभुज : जिस त्रिभुज की दो भुजाए सामान होती है उसे समद्विबाहु त्रिभुज कहते है . (3) Heterogeneous (Scalene) Triangle : A triangle having three sides of different lengths is called a Heterogeneous scalene triangle. विषमबाहू त्रिभुज : विषमबाहू त्रिभुज की तीनो भुजाए असमान होती है . 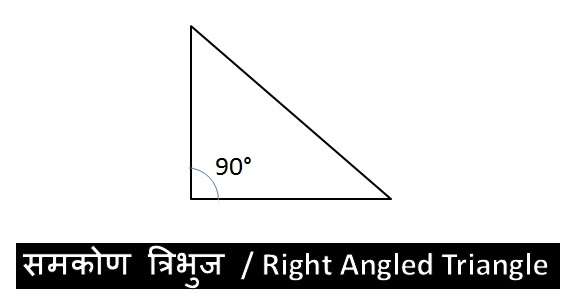 (1) Right Angled Triangle (Rectangle Triangle): Right Angled Triangle Have One Angle is 90 Degree Other Two Angle May Be 30-60 Degree , 45-45 Degree Etc. समकोण त्रिभुज : समकोण त्रिभुज का एक कोण 90 डिग्री का होता है अन्य दो कोण 30 - 60 डिग्री या 45 - 45 डिग्री के हो सकते है . 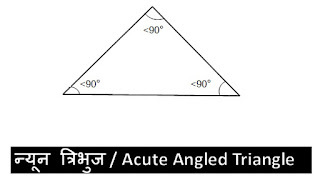 (2) Acute Angled Triangle : A triangle whose all angles are acute (Less Than 90 Degree) is called an acute-angled triangle. न्यून कोण त्रिभुज : जिस त्रिभुज के सभी बाह्य कोण 90 डिग्री से कम होते है वह त्रिभुज न्यून कोण त्रिभुज कहलाता है . 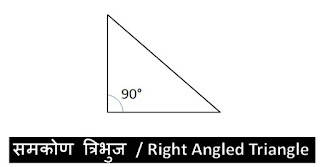 (3) Obtuse Angled Triangle : A triangle whose one angle is obtuse (Greater Than 90 Degree) is an obtuse-angled triangle or Obtuse triangle. अधिक कोण त्रिभुज : जिस त्रिभुज का कोई एक कोण 90 डिग्री से बड़ा होता है वह त्रिभुज अधिक कोण त्रिभुज कहलाता है . 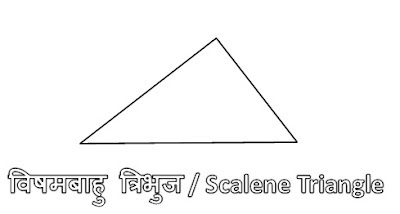 त्रिभुज का क्षेत्रफल = [1/2*आधार *ऊंचाई]. त्रिभुज का क्षेत्रफल = √[s(s-a)(s-b)(s-c)] ,यहाँ पर s = 1/2(a+b+c) है तथा a,b,c त्रिभुज की भुजाए है . 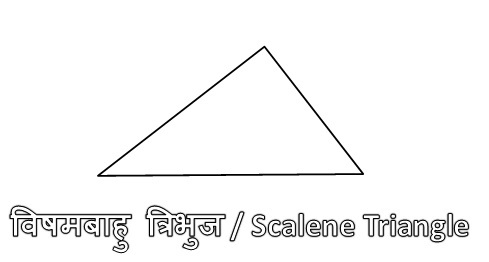 समबाहू त्रिभुज का क्षेत्रफल = [√3/4 *(a)²] यहाँ पर a त्रिभुज की भुजा है . Area of Triangle = [1/2*Base *Height]. Area of Triangle = √[s(s-a)(s-b)(s-c)] , Where s = 1/2(a+b+c) है And a,b,c all Are Arms of Triangle. Area Equilateral Triangle = [√3/4 *(a)²] where a is arm of triangle.